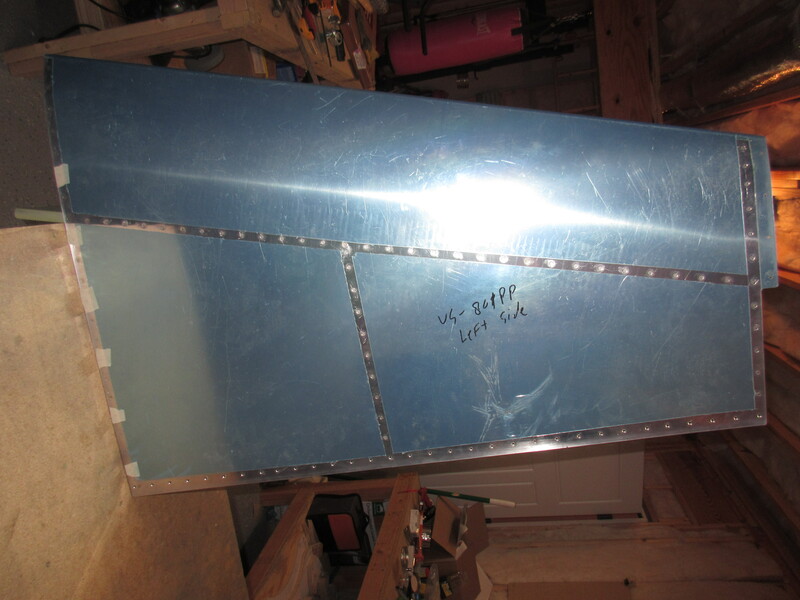 Tonight I worked about 4 hours and completed the Vertical Stabilizer, except for the rear spar, which I am leaving off until the EAA Tech Counselor can come by and take a look at my work. This will give them access to view and check my riveting and assemblies. 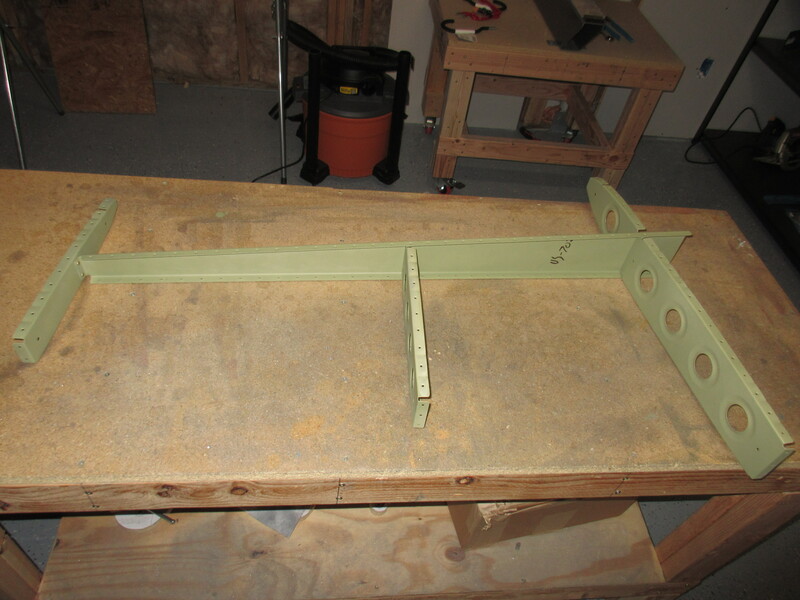 Once they sign off, I will rivet on the rear spar to both the Vertical and Horizontal stabilizers. Once the skeleton was done, it was time to cleco on the skin and make sure it was lining up correctly. This was about the time I realized I hadn’t dimpled the skin yet…whoops. heh. So, I rolled the DRDT-2 over to the bench and spent the next 15 or 30 minutes dimpling the skin. Before dimpling, I made sure to tape up the holes along the root that are marked in the plans for nut plates to hold the fiberglass fairing in the future. NOW, I can finally cleco the skin to the skeleton and get it ready for final riveting. 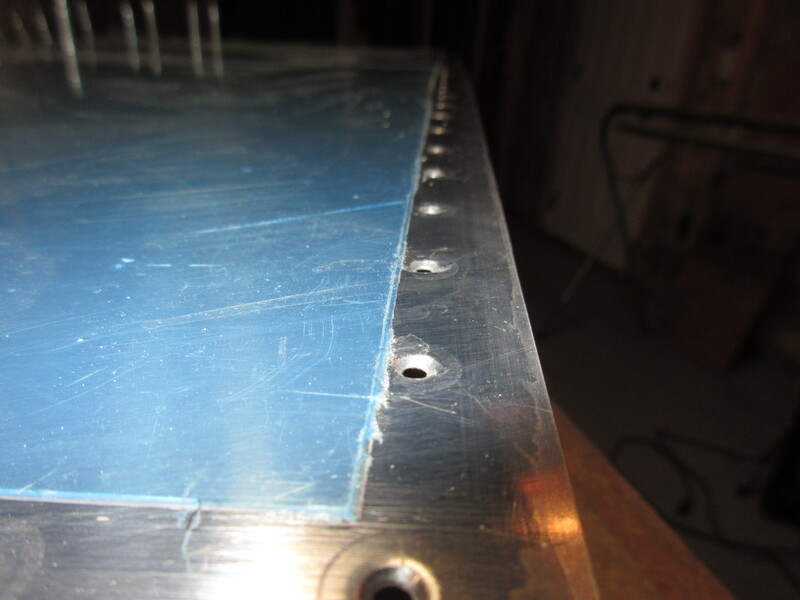 I clecoed every hole on both sides because this is a large surface with some complex curves around the leading edge. I figure a little extra work of clecoing will pay off when the results are smooth and oil-can free. After the skin was clecoed fully on both sides I begin to rivet it down. 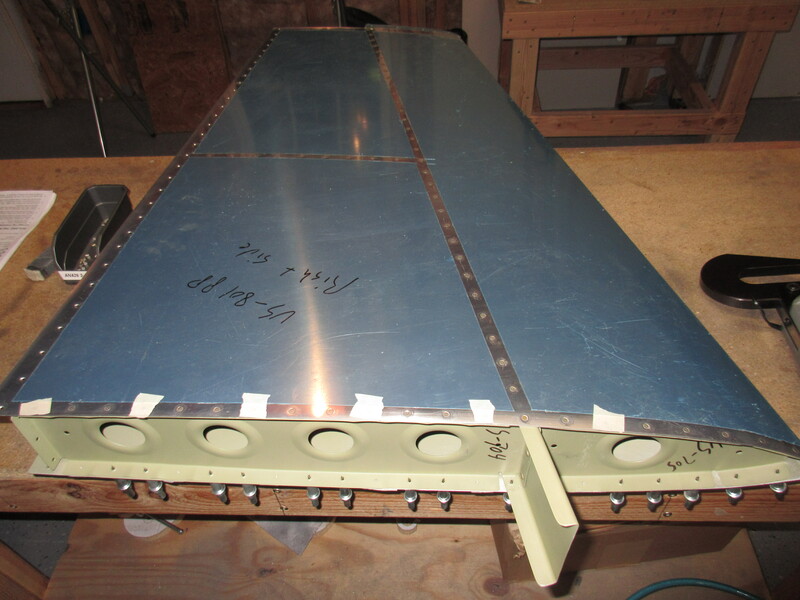 The plans has us start out at the intersection of rib VS-707 and work towards the top along VS-702 front spar. This first rivet is a little longer due to the converging ribs, but thats the only one. All the others were a AN426AD3-3.5. After working up the spar to the top, I came back and worked toward the root along the front spar, alternating to the VS-707 center rib. This is to get the skin down flush and prevent pillowing or oil-canning. Once all the rivets were driven along the ribs, it was time to squeeze the ones along the end ribs. I started on VS-706 and the leading edge and worked toward the trailing edge, and did the same thing with the VS-704 and VS-705 root ribs. Once I had the left side done, I flipped it over and did the same to the right side. I am happy with the results! There’s no dents, dimpling, smiley’s or oil canning. This thing will paint up nicely along with the horizontal stabilizer. If I can keep this quality of work up, I might end up with a decent looking airplane! Tagged Front Spar, Vertical Stabilizer. Bookmark the permalink.